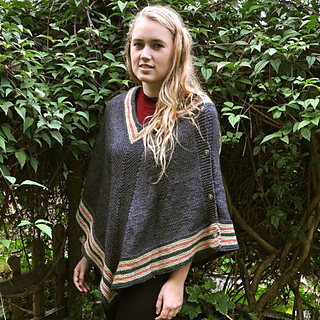 Small: 32-34" Bust, Med/Large: 36-42" Bust, XL/XXL: 44-50"
The Bessie May Nettle Art Deco Cape, with framing stripes, emphasising the flowing art deco symmetry. 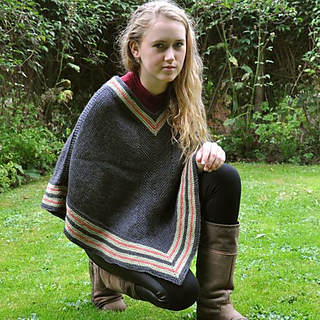 Side buttoning, allowing cape to also be worn as a wrap or cover. Versatile as well as stylish and snug. 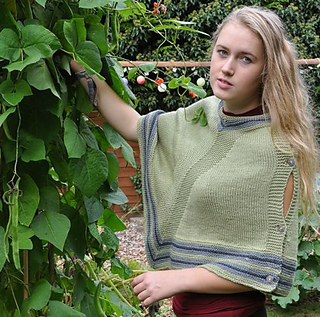 Knitted in two mitred identical diamond pieces, cleverly shaped by symmetrical decrease. Combination of stocking stitch and garter stitch panels. Stripe colour work, and button holes.